Show everyone what life is all about with our Personalized Grandma Shirts. This Personalized Grandparent's Day Gift for Grandma or Mom makes the perfect, unique gift your Grandmother or Mother will cherish forever. Your new Personalized Gift Shirt is available on our premium white 100% cotton T-Shirt, machine washable in adult sizes S-3XL. Also available in Pink or Ash Gray. Our Personalized Gifts are personalized free. 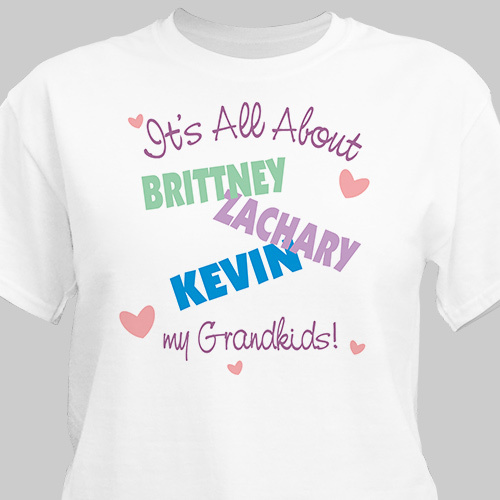 Personalized Shirts for Grandma or Mom can be customized with any title and up to 30 children or grandchildren’s names. 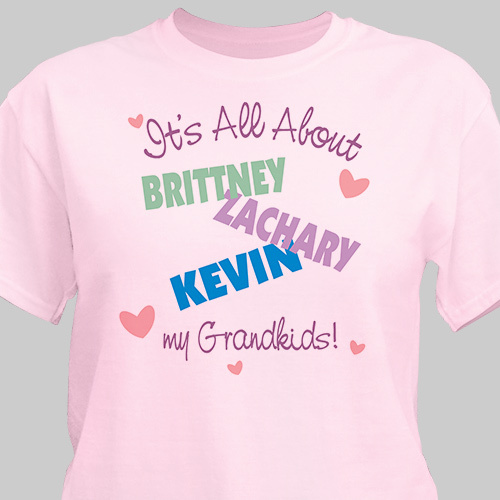 That’s right personalized shirts can have any title: Mom, Grandma, Nana, Aunt Betty or any special title. Also makes a great personalized gift for Aunt’s. Make the title Aunt Betty’s or any name and include the nieces and nephews. Makes a great gift for Grandma on Grandparents Day. I liked this - very colorful - would like more colors of t-shirts but know it would be hard with the colored names.